Whirlpool microwave ovens incorporate a recirculation, or blower, fan for venting purposes while cooking. The fan mounts in the top of the microwave oven and circulates air around the outside of the microwave's cooking compartment. As with any electric motor, the fan motor may eventually quit working. If this happens, you can replace the fan motor and blower instead of replacing the entire microwave. Whirlpool microwaves use a fan for venting and circulating air while cooking. 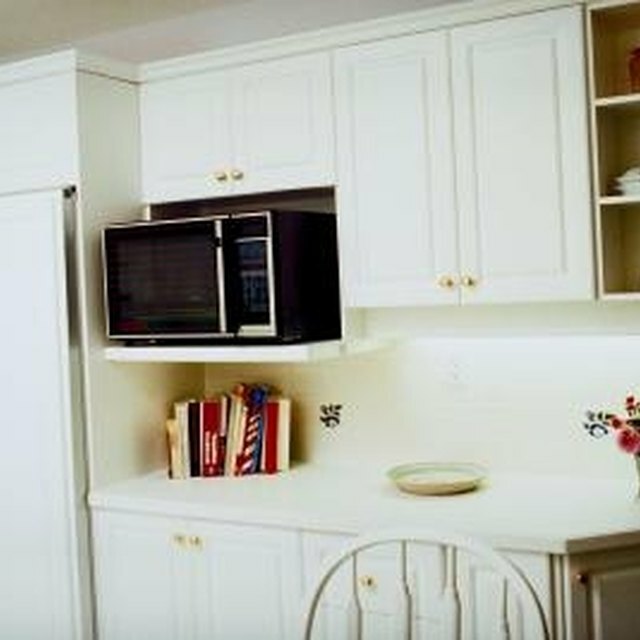 Unplug the microwave from the wall outlet to prevent an electrical shock while working on the microwave oven. Remove the screws holding the fan shroud to the top of the microwave oven. Using a Phillips-head screwdriver, turn the screws counterclockwise to back them out of the panel. Set the screws in a safe place so they will be available for installing the new fan. Slide the fan shroud--also referred to as a damper plate--forward, toward the front of the microwave, to remove it. Set the shroud to the side. Lift the fan assembly out of the microwave. An electrical cable and plug is accessible once the fan assembly is out of the way. Unplug the electrical connector from the fan and fully remove the fan assembly. Set the new fan assembly close to the top of the microwave to facilitate plugging the new fan into the microwave's connector. Plug in the fan assembly. Position the new fan in the same orientation as the old fan's before its removal. Lower the fan assembly into position. Slide the fan shroud in place and install the screws to secure the shroud. Tighten the screws with the Phillips-head screwdriver by turning the clockwise. Plug the microwave oven into the wall outlet and test the new fan installation. Clean the microwave with a kitchen cleaner to remove buildup of grease and oil before servicing the microwave. Ensure that the microwave is unplugged before performing maintenance or service. How Do I Change Out the Fan in a Magic Chef MCWC44DZ Wine Cooler?